This pizza making excursion started at the Public Market as many of them do since nothing inspires me to cook more than fresh ingredients. This time I ran into my landlord who happens to grow mushrooms at Timber Trails Forest Farm in Bristol, NY (lucky me right?) and I got a beautiful bright yellow bag of chanterelles that he had recently harvested. Pizza popped to mind right away as it usually does and I started planning. I had been meaning to make pizza soon with the Caputo 00 flour that I got from my mentor Giuseppe over at Fiamma to try out in my home pizza making rig with the Baking Steel. This is the premier flour for neopolitan style pizza dough and I didn’t want to screw up too badly on my first try with it so I went with my go to for recipes, Kenji Lopez-Alt from Serious Eats. I’ve used his recipes on a bunch of successful cooking projects so this was a no brainer for me. Using his Basic Neopolitan dough recipe, I whipped up enough for 4 dough balls and let it proof overnight to build some flavor. I used his 60% (by weight percentage of the weight of the flour used) hydration but went a touch over the 2% salt and 1% yeast as I tend to like a bit more of those ingredients in my dough. I punched it down in the morning and let it rise until I got home from work for some extra proofing time. I centered the toppings around the chanterelles and some local mild Italian pork sausage from a ½ pig that my friends and I bought together. For sauces I made some kale pesto with garlic and olive oil after a quick saute in some extra sausage fat and then a puree in the food processor. I added some miso and fermented garlic from Small World Food to finish off that sauce and moved on to the traditional San Marzano tomato sauce. Simply done with tomatoes, garlic, olive oil, salt and pepper it is my go to sauce and really easy to make it the food processor as well. The chanterelle mushrooms were cooked with garlic, salt and sausage fat after cleaning and being chopped into bite size pieces. 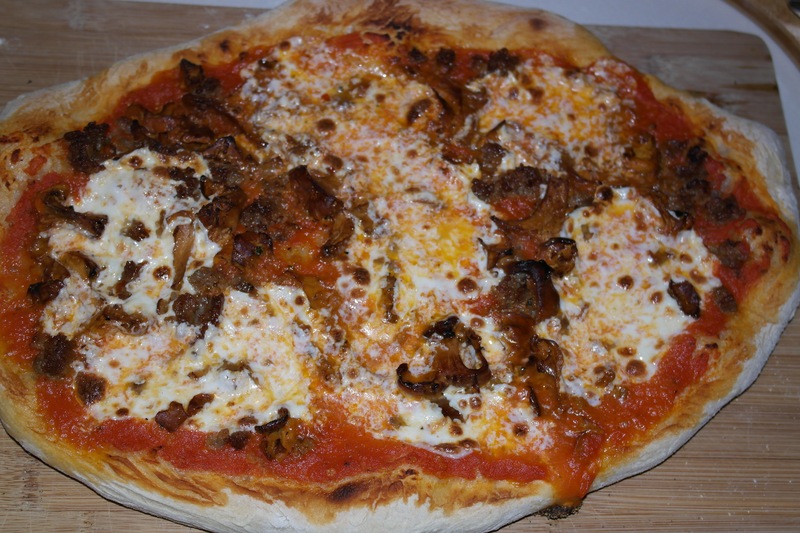 The chanterelles and sausage went on both pizza styles and the only variable was the sauce type. 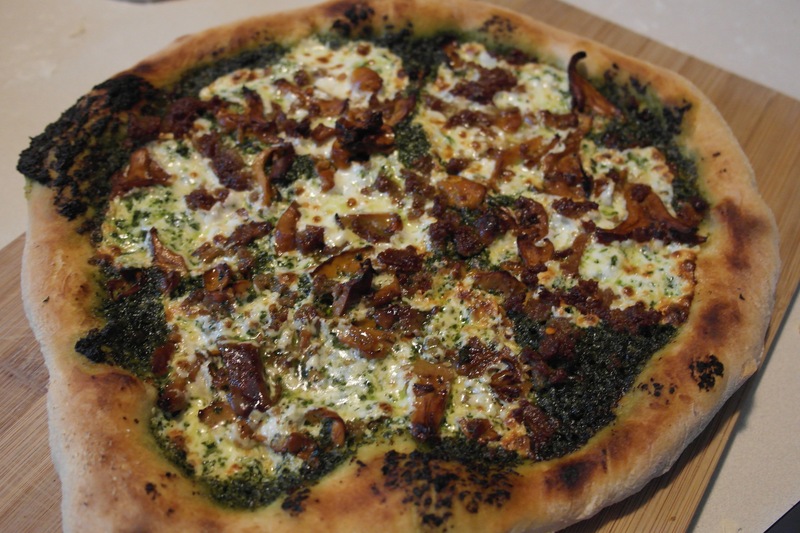 Each pie was constructed with sauce, fresh mozzarella cheese, mushrooms and sausage chunks. I think I over worked my dough a bit since I had some difficulty stretching out my dough balls but they baked pretty well and both styles tasted good. The kale pesto was smooth and a good counterpart to the salty sausage and earthy mushrooms. My favorite of the two for sure. Not to say that the red sauce base was bad, but it kind of ended up tasting a bit like a basic sausage and mushroom pizza instead of highlighting some of the subtleties of the ingredients. I definitely want to experiment more with the Neopolitan recipe to dial it in but this pizza test was by no means a failure! The chanterelles look very good bud, have you thought about using porcini or morells for a more woody flavor? I also appreciate the whole milk fior de leche instead of that shredded swill. Not yet….this was just a situation where I had some free mushrooms to use and pizza was my best idea to get them in my stomach in a delicious way. Definitely fresh mozz but not my favorite since I had to buy it from the Wegs instead of my local cheese shop.